What's this? An ode to feminism that doesn't including the anthemic wail of "Sisters Are Doin' It for Themselves" by Eurythmics and Aretha Franklin? Thanks to a leap back in time, "Made in Dagenham" avoids such cloying nonsense, depicting a war cry for equality with a melodramatic, but engrossing screenplay that portions much of the emotional texture to the actresses involved, led by star Sally Hawkins, who's note-perfect as the leader of an unexpected army. In Dagenham, England, a Ford Motor Company manufacturing plant essentially employed the town, with the majority of the workforce comprised of men used to creature comforts. Stuck in a hot warehouse, sweating away while operating sewing machines are the female employees, growing increasingly restless with their low wages and hellish work environment. While union reps (including Kenneth Cranham) attempt to downplay the unrest, Rita O'Grady (Sally Hawkins) has no patience for lip service, inadvertently becoming the voice of a strike that would come to shut down the plant entirely, bringing great stress to the community and Ford itself. 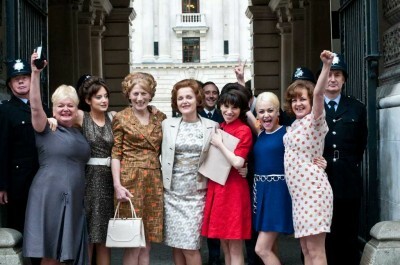 Striving for equal pay, Rita and the Dagenham women take their fight to the press, even reaching the halls of government, capturing the support of Secretary of State Barbara Castle (Miranda Richardson). "Made in Dagenham" comes from the director of "Saving Grace" and "Calendar Girls," which might be the best indication of the viewing experience that lies ahead. Dealing with historical happenings in the late 1960s, filmmaker Nigel Cole seeks a way to lighten up potentially dreary events through the charisma of his cast and the use of pop hits from the era, adding a little fizz to the brew before the chilling realities of life on the picket line settle in. It's a workmanlike directorial job, but the intended effect is there, with Cole supplying feel-good fringes to a vital tale of equality. The cast truly sells the impact of the film, with Hawkins out front and center as the leader of the pack. A meek seamstress with more than enough duties at home keeping her busy, Rita comes to bloom in the face of corporate indifference and gender discrimination, using her surprising pluck to voice honest concerns, rattling the suits with her demands. It's a splendid performance that feels out every step of the character arc, allowing Hawkins to command the screen with her expressions of frustration and, when the fight carries on far longer than she imagined, guilt. 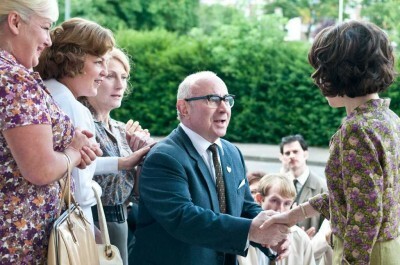 The cast also includes superb turns from Bob Hoskins (as Rita's supportive boss), Rosamund Pike (a stifled woman enlivened by news of the strike), and Richard Schiff (effortlessly menacing as a Ford executive), but Hawkins is integral, carrying the weight of the film with a beautiful vulnerability, tempering the sisterhood boogie with a needed read of bruised conscience. "Made in Dagenham" has a few overly hysterical melodramatic diversions, including a brief detour into suicide that threatens to derail the entire film. When focused on the intimacy of the strike and its spirited participants, the picture nails a few magnificent scenes of hesitation and fortitude, a gripping complexity that services the needs of the film and respects the amazing true-life story that inspired it. Buy tickets to "Made in Dagenham" now!